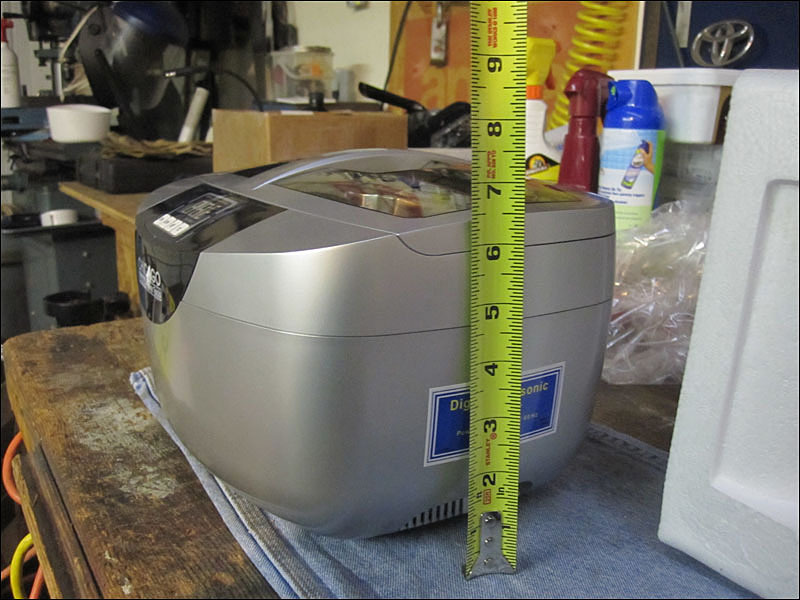 I've had this little ultrasonic cleaner for a while now and decided to finally post up some pictures. I had been watching the price on this machine come down from almost $200 to a more recent low price of about $80. Then you go to your Harbor Freight armed with a coupon and you can get one of these for around $60 which makes is affordable. The time this can save you cleaning intricate parts is immense. Plus some things you just can't clean like the insides of carburetors for example. 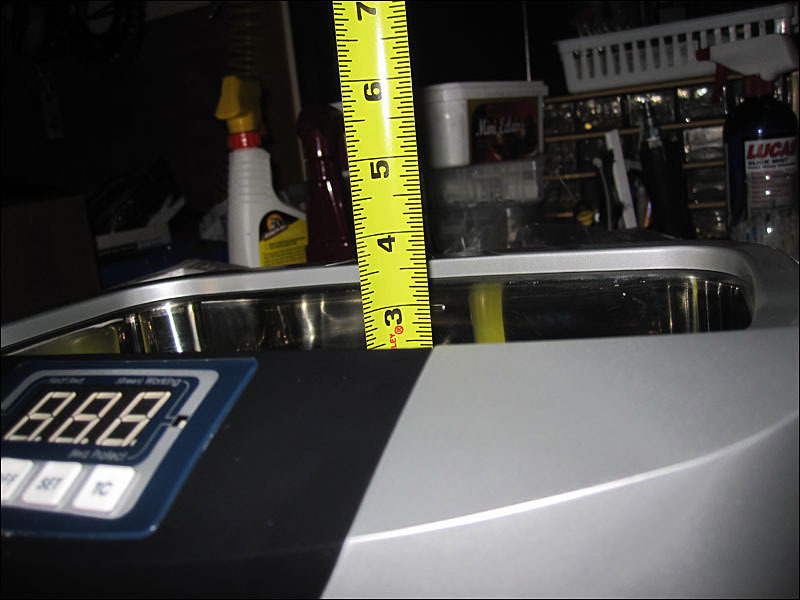 Here are some pictures and measurements just to show everyone what you get and how it works. It's a great little cleaner and I use it a lot for cleaning tools actually. I've found and bought old rusty tools and cleaned them right up with this little guy. And now for the pictures. 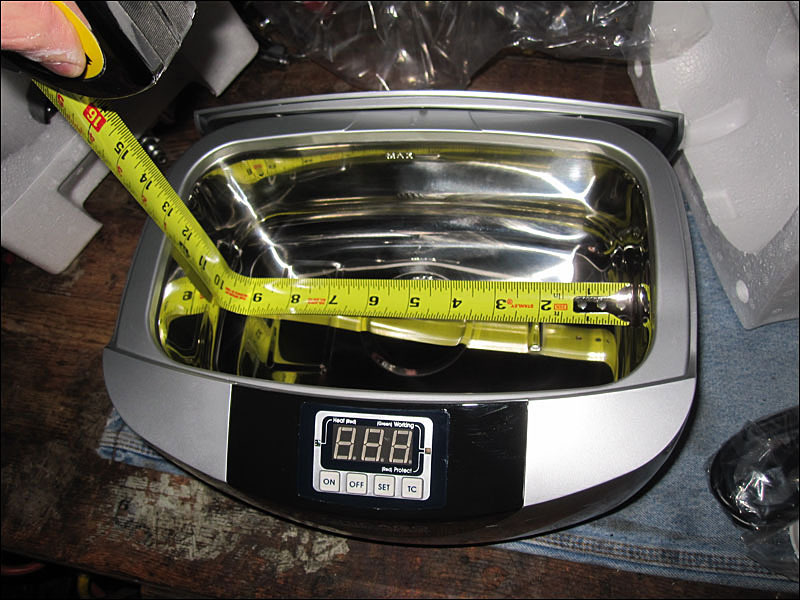 I made sure to grab a tape measure so you can check to see if what you might want to clean or dip in this machine will actually fit. 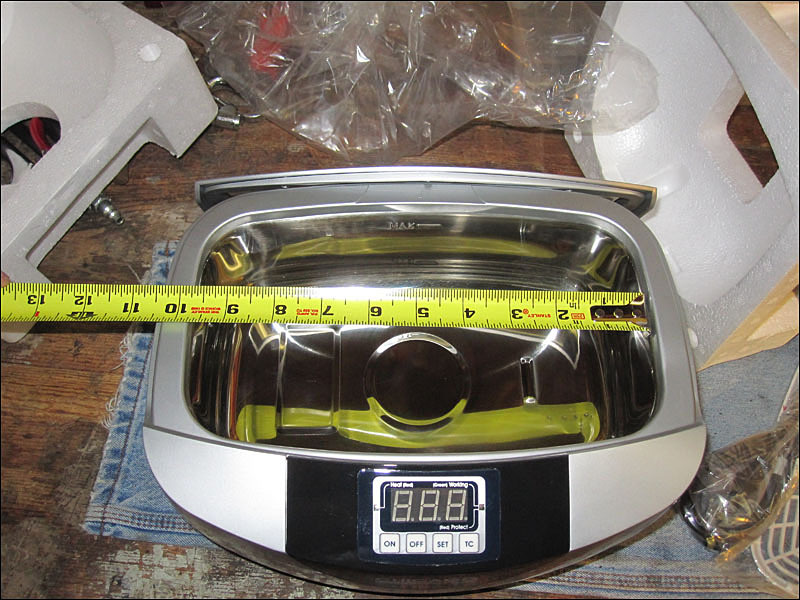 A friend of mine has a much more expensive commercial machine that isn't nearly as wide so he can't fit as much stuff in his ultrasonic cleaner at all. But the timer on his machine will allow him to run the cleaner for a much longer time whereas these Harbor Freight cleaners only allow you to run the machine for 480 seconds at a time. Then you have to click the button again to keep it going. More pictures tomorrow including the machine in use with some various tests and heat readings. 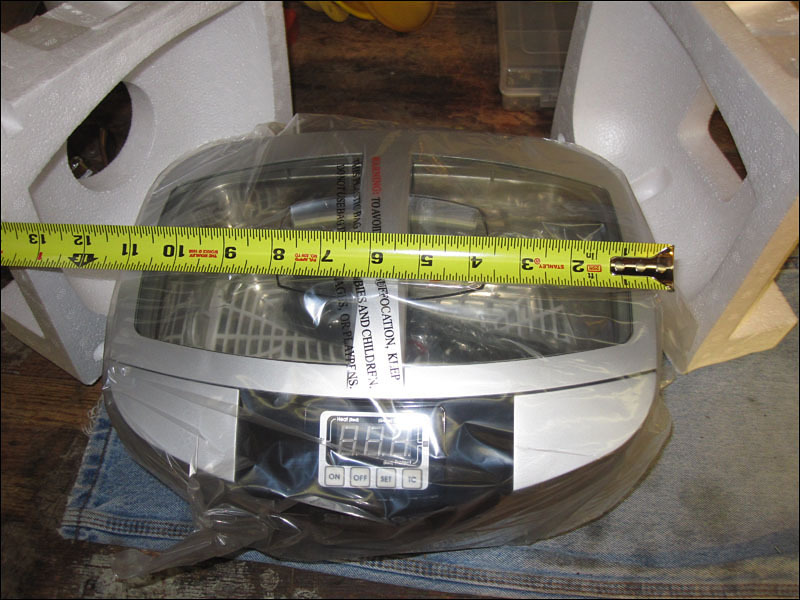 I have the identical unit, also from Harbor Freight. Seems to do a decent job of blasting away small particles and hidden gunk. I've only used warm soapy water and it's done quite well. $60?!?!?! I paid $800 for the one I use at my shop. You can't beat that for home use! Eight minutes seems a bit hokey though. I've found that most anything worth cleaning takes at the very least 30 minutes in our industrial machine. But some really nasty bits might take as much as 2 hours. We also use a chemical called "shellac remover." Smells weird and you don't want to get it on your hands in non-diluted form, but it works excellently on everything from carbs to rubber. I even dunked my CA95 head in it before I put it back together! Last edited by Noobens; 03-22-2012 at 02:44 PM. Well I'm sure the one you have is a bit larger and can be left on for an hour at a time! The cheapy I have will probably burn out if I wired it to stay on that long. I'll have to look up that solution that you mentioned. 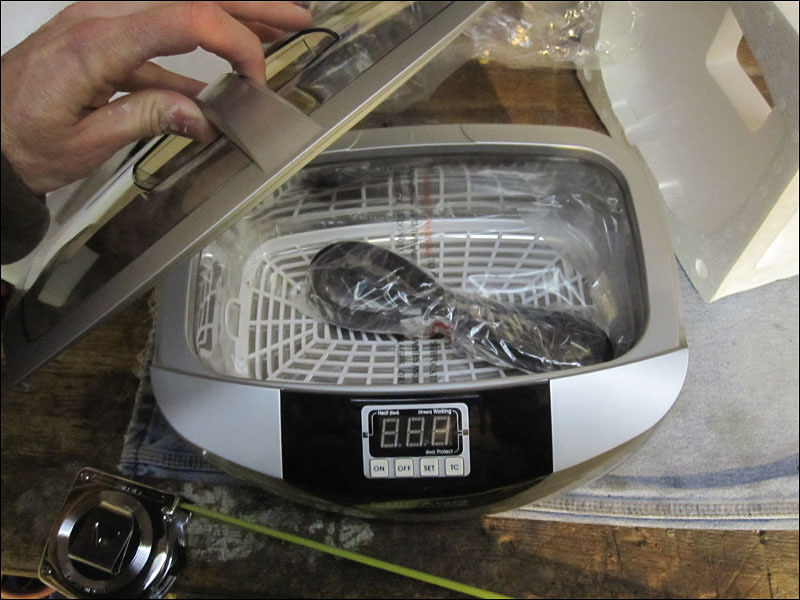 Noobens, what brand ultrasonic cleaner are you using? We purchased ours through Sharpertek. They looked the toughest, had the most features (an adjustable thermostat was a must, and shockingly most simply have on/off), and honestly were priced to move. We kind of lucked out because they were having a mega sale and we got a $2,000 cleaner with around $200 in chemicals for $800 shipped to the door. A few days later the price skyrocketed up. It may have been a mistake in the listing that they had to honor, who knows. Anyway, it works like a champ. It runs pretty much 7 hours a day 5 days a week and has done so with no problems in nearly 2 years. I'd say that's worth the $800!! Oh and it's also made in the USA which is a big plus. I tried their 1220 Carburetor specific stuff, but I think the Shellac-Buster is a better chemical. Supposedly it's reusable but at $175 for a five gallon bucket, I put fresh stuff in every time. A five gallon bucket of this stuff usually lasts me over a year and would be WAY too much for a home machine. They do make a little one gallon bottle, but at $65 it's a tough sell for home use. Last edited by Noobens; 03-19-2012 at 01:36 PM. I've been eyeing a sharpertek or a kendall. Sharpertek is a little more expensive and i'm not sure I want to spot the money for that. 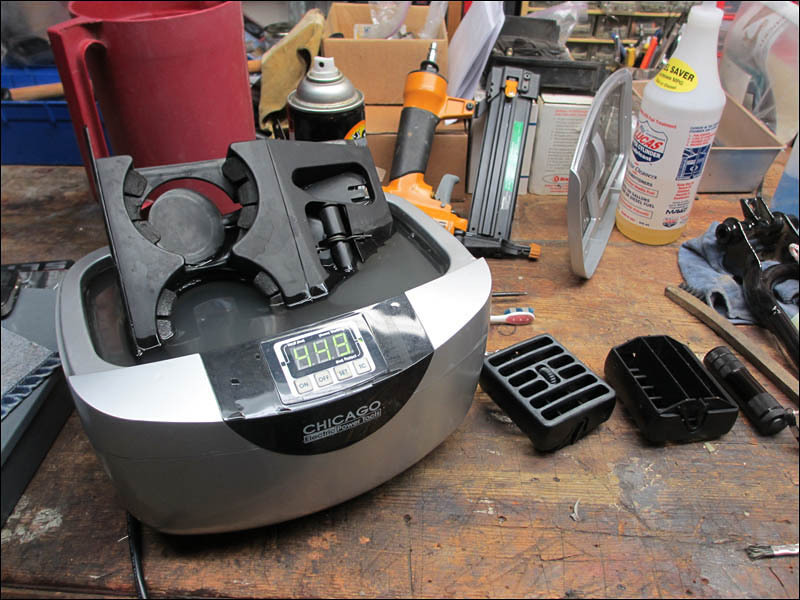 The dirt and muck is caked on the outside of the engine parts so thick and in the crevices that ultrasonic cleaning seems to be the best way to get it. But honestly, i'm not sure. The 12x9x6.5 would clean a ton of the parts (not just engine and carburetor). 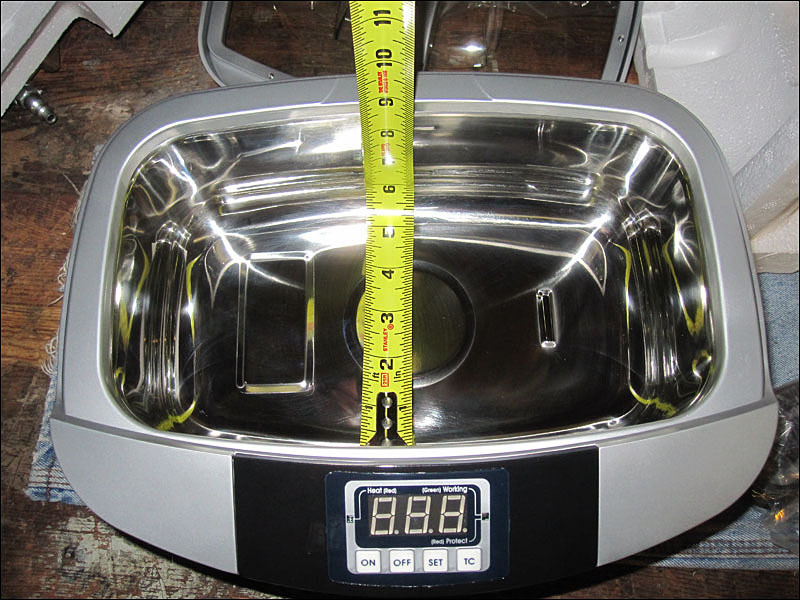 Whats your experience with cleaning aluminum parts with an ultrasonic cleaner? All I'm cleaning really is dirt and oil from parts. Problem is the dirt is in the most hard to reach places and its burnt on hard. Oh wow those are expensive but commercial duty for sure. A friend of mine bought the smaller one they make for $200 shipped and he doesn't like it at all. I'm sure he would give it to me if I asked . You can barely fit anything into it it's so small. He bought some special powder you mix in with water and it was so ineffective he just gave up using it. 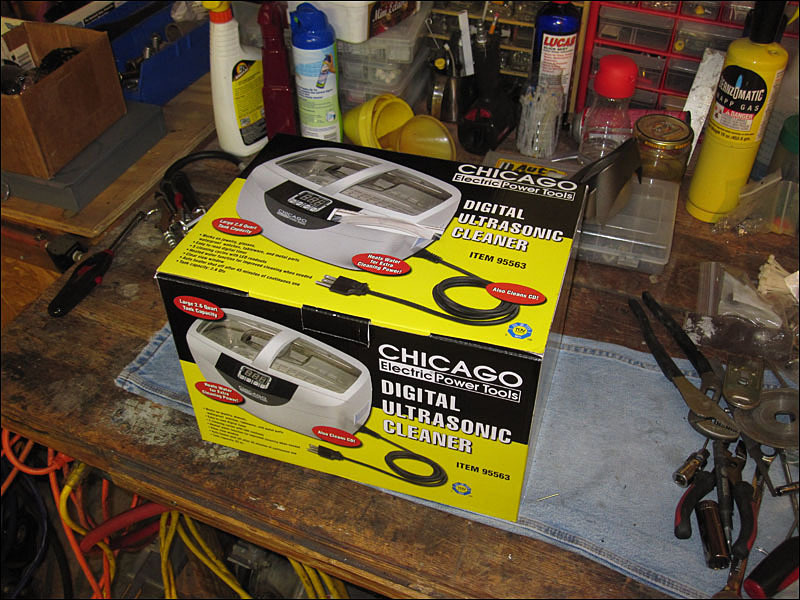 I don't expect mine to remove thick dirt or caked on junk but if I soaked the part overnight I'm sure the little Harbor Freight ultrasonic cleaner would... maybe. I would just have to baby sit the thing cause the times only works for a few minutes at a time. When I have to clean a cylinder head I take it to a transmission or machine shop that has one of those high pressure steam water cabinets. Those things clean amazing. Here I am zapping the AC vents that I popped out of my Dodge truck. These things were smelly and filthy. It worked so good I threw the cup holder in there as well. Last edited by Smithers; 03-19-2012 at 07:51 PM. It is expensive, but given the amount of cleaning I'd be doing, I might be able to justify it. The Sharpertek model is a little out of my price range but the Kendal may be reasonable. I"m going to explore other options before I pop for one though. I"m going to check out the local machinist shop to see about a spray cleaning in a cabinet. I think i've come to the hard conclusion though to strip the frame. The rust inside the frame is pretty bad and difficult to reach with the sand blaster. There is a stripping company that has does this work on a large scale. A co-worker had an entire corvette frame stripped and powder coated for just under $400. I'm going to take my parts over one afternoon and see what the quote is. Link to the company website is below. This place is literally down the street from where I live, which makes it pretty convenient. I'm going to see about sourcing the original paint and have it done right. As far as certainly metals in ultrasonic the ONLY one I've come across that won't work is Magnesium. It'll pit the holy hell out of it for whatever reason. As for getting in to hard to reach places and get dirt out, it will do that too. If it's REALLY caked on though, you'll have to put it in for a while, rinse, and repeat until it's the desired cleanliness. Anything really burnt on may have to be blasted out. Aluminum works just fine. 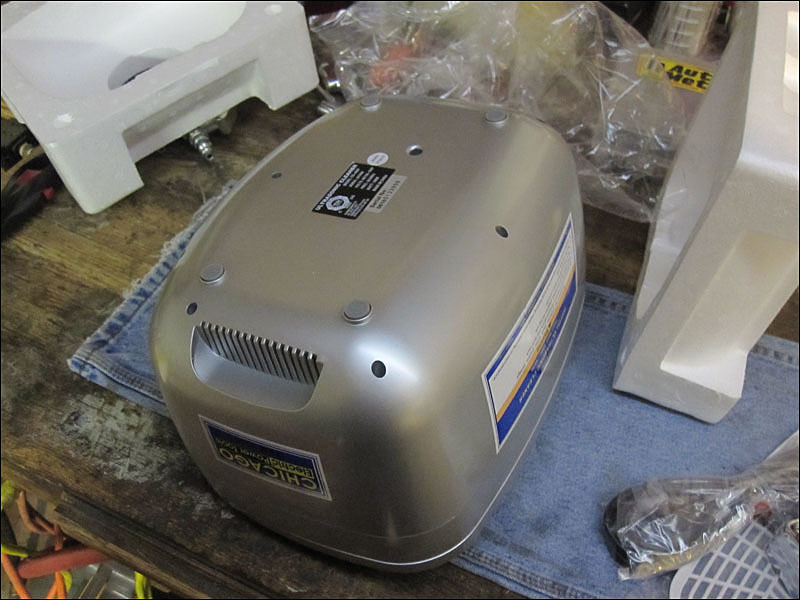 Just pulled the breather cover from a 1975 CB550 out of the cleaner minutes ago. It sat outside for over 20 years and it got all of the crap off of it, plus all the old oil residue on the inside as well. They really are great machines for pretty much anything. They work great on rubber, plastic, some elctronics are ok to throw in. Really if you're running into a lot of dirty crap, get the biggest one that you can afford. I believe this one is the one we have. I said a bank of 4 fully submerged and I meant bank of two haha. Looking to get one that will accept a full bank, and the next size up will take a full bank AND a basket of parts so I could get an entire four cylinder carb assembly done in one dip. I'd be willing to sell it for $500 plus shipping if anyone is interested. It's fairly heavily used, but it's under 2 years old and is still buzzing along happily (even as I type!). Everything still works like a charm. Comes with parts basket. 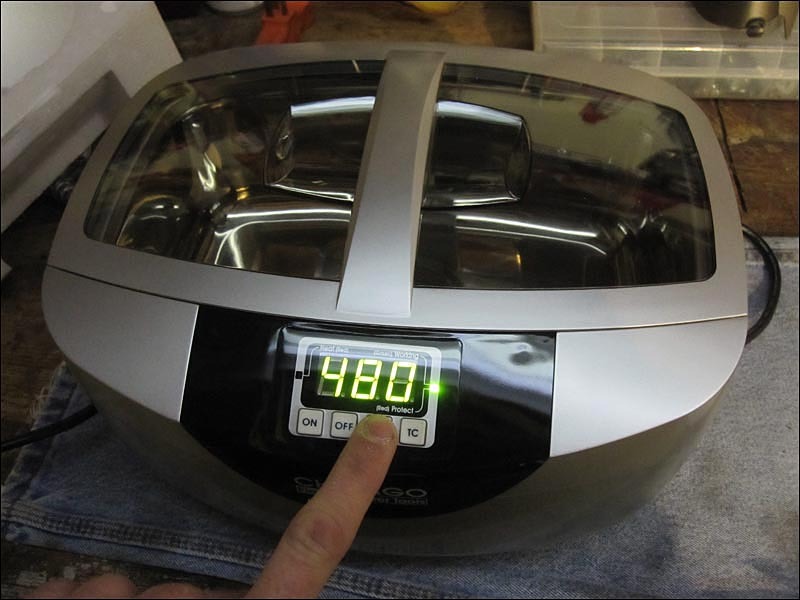 It will time in 5 minute increments up to 30 minutes and beeps when it's done cleaning (though you'll notice when the sound waves stop believe me). Also has a heater that goes up to some outrageous number but has been kept at 40 degrees Celsius since I've been using it. And a convenient drain as well so you don't have to try to lift it up and dump it into the sink which is a huge plus! If I found a serious buyer for this one I could probably convince my business partner to spring for the bigger unit haha. So I just figured I'd throw that out there. Last edited by Noobens; 03-22-2012 at 02:51 PM.